The bylaw against overnight street parking is being revisited again this year as Coun. Cheryl Miller "succeeded in convincing members of council's environment and transportation committee to ask staff for a report" on lifting it during the summer, according to the London Free Press today. What a lot of bother! It seems that no business can ever be conducted at city hall without first creating make-work projects for the idle army of bureaucrats that inhabit it… and no better way to disengage anyone's attention to the subject long enough for the idea to be shelved yet again. After all, staff delivered a report on exactly the same proposal to the same committee just last year, after which it was rejected for the simple reason that city hall would lose upwards of $100,000 in fine revenue. The probity and authority of the law are cheapened when laws are sustained, not for any principle of defending right and punishing wrong, nor even for any genuine considerations of safety or utility, but only for the pinching and grasping of cold hard cash. So why should anyone suppose, on the face of it, that any of the other hundreds or thousands of bylaws enforced by fines are motivated by any greater purpose? The Free Press also reports that $3 million in municipal taxes last year went to support London's five apparent tourist "destinations," although destination seems like a strong word for any hole-in-the-ground that requires such gross subsidization to survive. According to the Free Press, municipal subsidies to Fanshawe Pioneer Village and Museum London (which also operates Eldon House) amounted to $13 per visitor in 2006, and $9 and 95¢ per visitor to the Guy Lombardo Museum and the London Regional Children's Museum respectively. The city-run Storybook Gardens also faced a revenue shortfall of about $200,000 last year, and will be receiving a $199,000 capital upgrade in 2007. Any cost, however, is small considering the kind of experience those places offer people, said Sheila Johnson, the executive director of Fanshawe Pioneer Village. "Support is essential . . . as a cultural investment, but also as an economic investment," Brian Meehan said yesterday, adding such sites are "critical for the city to be a livable place." "The reasons individuals and companies cite for moving to a particular community is, what kind of culture do they have?" Meehan said. "What can you do after five o'clock?" After five o'clock nobody will be much visiting these landmarks because they're generally closed. But it's only part of a parcel of such incoherent nonsense that Londoners can only conclude they're receiving a very poor return on investment in rhetorical apologetics. Companies might cite such drivel as a reason for locating in the company of such vaporous blowhards as Meehan, but in their offices they are looking for competitive advantages that include not having to pay taxes for squandering on fools and white elephants. Individuals in return will as more than likely cite employment opportunities from companies that make profitable location decisions. And, of course, implicit in Meehan's unoriginal cant is the idea that $3 million of taxpayers' money would just otherwise disappear down a sinkhole, and that it is the responsibility of people like himself to dispose of it for Londoners' good. Incidentally, Museum London received $1.458 million from taxpayers last year to support 142,000 in general and public program attendance, and will receive $1.503 million this year (Boards & Commissions PDF). In addition, it received $364,000 in government grants and subsidies as part of its $2.806 million expenditures last year, meaning that well more than half of its operation is dependent on taxpayers. Similarly, most of the other deadweights on London's subsidized list also receive grants and subsidies from tax-funded agencies like the Canadian and Ontario Arts Councils, the Department of Canadian Heritage, and the Trillium Foundation. As it stands, the city pays about $13,000 a year to keep the Lombardo centre open 35 hours a week from June until Labour Day, and Sunday afternoons thereafter. About 1,000 people visit the museum every year. "It's not ever going to be a major tourist attraction," says John Winston, director of Tourism London. "It never has been and it never will be." […] Ken Palmer is former artistic director of the Home County Folk Festival and a founding member of the Dixie Flyers. He's also an avid musicologist and Lombardo fan. But he harbours no illusions about the Lombardo museum. "That thing (the museum) has been there forever and nobody's showing up," says Palmer. "Nobody goes to it because nobody cares . . . and it's not going to get any better." It's tough to keep going on the same tax-and-spend regime when even the director of Tourism London won't give you a break. Paul Hellyer, 83, is calling for a public disclosure of alien technology obtained during alleged UFO crashes -- such as the mysterious 1947 incident in Roswell, New Mexico -- because he believes alien species can provide humanity with a viable alternative to fossil fuels. Mr. Hellyer has been a public UFO advocate since September 2005 when he spoke at a symposium in Toronto. But with concern over global warming at an all-time high, and Canadian political parties struggling to out-green one another, Mr. Hellyer said governments and the military have a responsibility to "come clean on what they know" now more than ever. "Climate change is the No. 1 problem facing the world today," he said. "I'm not discouraging anyone from being green conscious, but I would like to see what (alien) technology there might be that could eliminate the burning of fossil fuels within a generation ... that could be a way to save our planet." The fancy name for the concept is Domestic Tradeable Quotas, or DTQs. It's a scaled down version of Kyoto, also known as a cap and trade system, that would engage the average Joe in a game of personal carbon trading much like the countries signed onto the Kyoto agreement. Everytime Joe goes to fill up his car with gas, for example, he would turn over his debit card and a second piece of plastic for the attendant to swipe -- a carbon card. The card would deduct carbon units from his yearly allowance, or cap, much like a debit card withdraws money from his bank account. Should Joe run out of carbon units, the gas station would then buy credits for him on the open market, or trade, and the cost is added to his bill. If, however, Joe has surplus units because he takes public transport, he can sell them back to the market for hard cash. The same would apply for paying heating and electricity bills. [..] " To equalize welfare, we may need to give people unequal amounts of resources in order to assuage different people's hunger." Big THANKS to the WE for giving us a choice. "We should have equal houses. They should be standard sizes." A ban was initiated at the Hilltop Children's Center in Seattle. 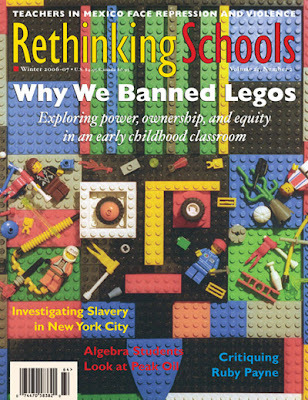 According to an article in the winter 2006-07 issue of "Rethinking Schools" magazine, the teachers at the private school wanted their students to learn that private property ownership is evil. According to the article, the students had been building an elaborate "Legotown," but it was accidentally demolished. The teachers decided its destruction was an opportunity to explore "the inequities of private ownership." According to the teachers, "Our intention was to promote a contrasting set of values: collectivity, collaboration, resource-sharing, and full democratic participation." They claimed as their role shaping the children's "social and political understandings of ownership and economic equity ... from a perspective of social justice." So they first explored with the children the issue of ownership. "A house is good because it is a community house." "It's important to have the same amount of power as other people over your building." Copies of the Communist Manifesto were distributed to the children after the lesson. Nothing is surer under this sun, despite any amount of increase in standard wealth or general health and well-being, than that imagined mass grievances and contrived mass restitutions will be aired by those who have little or no claim to either, as is shown by the opening paragraph of William Graham Sumner's introduction to his 1883 book, What the Social Classes Owe to Each Other (available online at the Ludwig Von Mises Institute, link via Alice the Camel). The only novel thing is that humanity itself has been stretched so thin as an abstraction by the political rhetorics of the would-be managers of human endeavour that only new and utter abstractions like the "environment" sustain any real attention these days, and so the superstar "heralds of the coming duty and the coming woe" are now people like David Suzuki and Al Gore. … D may just as easily be substituted as a person with an inscrutable quality like the environment instead. C, the Forgotten Man, is of course the majority of people whose industry makes possible the abstractions for which they are prevailed to pay, because those abstractions are necessarily relative to the wealth that can be expected to bear the cost of them. What Sumner may not have anticipated is that public education is busy about the business of obviating C.
As to be expected, Sumner's abstraction of the Forgotten Man himself suffers from the same equivocations and imprecision that all abstractions require, and a few of his observations elsewhere are coloured by strange or long-forgotten prejudices, but its construction contains a great deal of explanatory value. So What the Social Classes Owe to Each Other is highly recommended reading. According to a study done by a collection of nameless bureacrats found skiving off in Victoria Park, Londoners have been using spermicides since the Sixties. This flagrant spraying has done considerable ecological damage. While there does not currently exist any supporting scientific evidence to support the following claim, the study asserts that one animal has indeed died as a result of over-spermicidal spraying. "We firmly believe the Tyrannousaurus Rex would be with us today," the head of the study told the Freak Press, "if not for people spraying where they shouldn't. " Gov. Arnold Schwarzenegger leaves a big environmental footprint for one man, specifically with his frequent use of private jets to ferry him throughout California and the world. His two estates are large enough to house small villages. And the champion of environmental controls to curb global warming pumps far more carbon dioxide into the atmosphere than an ordinary citizen, by far. He is driven everywhere in a caravan of two black SUVs and, sometimes, a lead sedan. Depending on the private jet he chooses from NetJets - usually it's a relatively large one, to include staff and CHP bodyguards - Schwarzenegger and his posse could dump as much as 8,700 pounds of carbon dioxide into the atmosphere for a single one-hour flight from Santa Monica to Sacramento, according to data from TerraPass, the carbon retailer. [..] By contrast, a single person traveling alone on a commercial flight from L.A. to Sacramento contributes 477 pounds of carbon dioxide to the atmosphere. To atone for his sins, the signatory of AB 32 is funneling some money to his researching comrades. 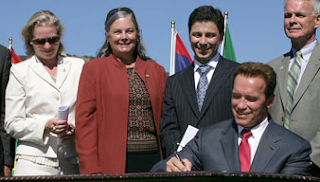 In addition to the $136 he paid to "offset" his trip to the Davos conference in Switzerland, Governor Arnold has also pledged to voluntarily register his emissions and plant more trees at your expense. The Tennessee Center for Policy Research, an independent, nonprofit research organization, has discovered Al Gore's energy bill is over 20 times the national average. Links via Drudge Report. A spokesperson for Gore does not dispute the data, but insists the Gores are making efforts to reduce their energy consumption by installing solar panels on their home and switching to other renewable sources of energy. Kalee Kreider, a spokesperson for the Gores, did not dispute the Center's figures, taken as they were from public records. But she pointed out that both Al and Tipper Gore work out of their home and she argued that "the bottom line is that every family has a different carbon footprint. And what Vice President Gore has asked is for families to calculate that footprint and take steps to reduce and offset it." [..] "They also use compact fluorescent bulbs and other energy efficiency measures and then they purchase offsets for their carbon emissions to bring their carbon footprint down to zero." If Kreider was my spokesperson, I'd fire her. Bigfoot Gore can purchase all the "offsets" he wants with the proceeds of his inconvenient fear-mongering film, but he still remains a hypocrite. If the former Vice President really cared about the polar bears, he'd dump the SUV, along with his 20 room mansion with a heated pool, and stop flying around the planet preaching about green house gases. Prince Charles today said banning McDonald's fast food was the key to a healthy lifestyle. His comments came as he attended the launch of a public health awareness campaign. Diabetes Centre in Abu Dhabi with the Duchess of Cornwall. 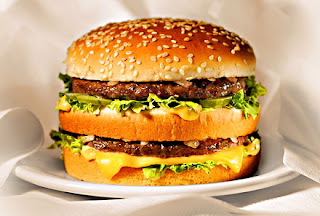 He asked nutritionist Nadine Tayara: "Have you got anywhere with McDonald's, have you tried getting it banned? That's the key." Cars should also be banned, along with all motorized vehicles. If the common people were forced to walk, not only would obesity disappear, but the planet would be saved! Maybe the entarte-tainment industry couldn't quite manage to get him elected President, but darn it, they do have it in their power to give the mad Al Gore an Oscar for his sci-fi hit, "An Inconvenient Truth". A staff report on the agenda of today's meeting of city council's community and protective services committee recommends a new bylaw that would require building owners and others to remove graffiti quickly or face possible fines. If owners don't remove graffiti, city workers would. The bill would be added to the owner's tax bill. This new bylaw, if passed, would make property owners pay a fine for having graffiti on their buildings. It would also force legitimate property owners to promptly remove it at their expense or else the city will. 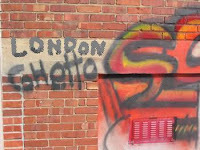 Of course, London's "Graffiti Gestapo" will not punish the culprits of petty vandalism, but the victim. Last year, police investigated 391 graffiti complaints compared with 161 in 2005. and laid 125 criminal charges last year, compared with 93 the year before. Meanwhile, bylaw enforcement officers -- using underage buyers in a sting-like blitz -- issued tickets to dozens of retailers for selling graffiti tools to underage customers. The tickets carry a $125 fine, although repeat offenders could be taken to court where they can be fined up to $5,000. "I've seen buildings covered in graffiti for months and months. If we're ever going to get this turned around, we've got to get it stopped and removing it is the best way to stop it. Otherwise, this city is going to look like one big slum." You're right about one thing Bernie: this city will look like a slum--when all the businesses ditch this red tape paradise and run for the hills. Give it a listen on your solar-powered Victrola. By the end, this super-catchy song will have even the most devout doomsayers bopping down the street with the refrain bouncing around their heads. 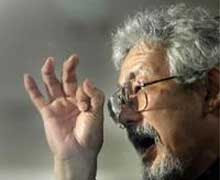 It goes, "David Suzuki Is A Fascist"
Like "David Suzuki Is A Fascist"
Though I have read much about Al Gore's Oscar nominated documentary, I refrained from actually subjecting myself to his rantings. Until last night that is. Finally succumbing to Basil's promptings, some of us London Foggers decided to tune in. Basil promptly tuned out and fell asleep, while Mike, Mapmaster and myself ingested nearly an hour of an unbelievably BORING series of disconnected graphs and closeups of Al Gore. Essentially, the film is a prolonged, self-congratulatory political ad for Gore himself. The main point of the movie is that, unless we do something very serious, very soon about carbon dioxide emissions, much of Greenland’s 630,000 cubic miles of ice is going to fall into the ocean, raising sea levels over twenty feet by the year 2100. Where’s the scientific support for this claim? Certainly not in the recent Policymaker’s Summary from the United Nations’ much anticipated compendium on climate change. Under the U.N. Intergovernmental Panel on Climate Change’s medium-range emission scenario for greenhouse gases, a rise in sea level of between 8 and 17 inches is predicted by 2100. Gore’s film exaggerates the rise by about 2,000 percent. [..] According to satellite data published in Science in November 2005, Greenland was losing about 25 cubic miles of ice per year. Dividing that by 630,000 yields the annual percentage of ice loss, which, when multiplied by 100, shows that Greenland was shedding ice at 0.4 percent per century. “Was” is the operative word. In early February, Science published another paper showing that the recent acceleration of Greenland’s ice loss from its huge glaciers has suddenly reversed. [..] It would be nice if my colleagues would actually level with politicians about various “solutions” for climate change. The Kyoto Protocol, if fulfilled by every signatory, would reduce global warming by 0.07 degrees Celsius per half-century. That’s too small to measure, because the earth’s temperature varies by more than that from year to year. 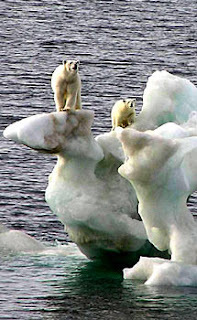 [..] Mendacity on global warming is bipartisan. President Bush proposes that we replace 20 percent of our current gasoline consumption with ethanol over the next decade. But it’s well-known that even if we turned every kernel of American corn into ethanol, it would displace only 12 percent of our annual gasoline consumption. The effect on global warming, like Kyoto, would be too small to measure, though the U.S. would become the first nation in history to burn up its food supply to please a political mob. Canadians find many uses for collected plastic grocery bags, but the number one use is putting garbage into them. The second most common use is putting their lunch into them. Sometime's Canadians will forget and put trash into a plastic bag and then unwittingly put their lunch into them. Canada also ranks #1 in the world for plastic bag injuries. Researchers are dumbfounded why Canadians put garbage into plastic bags only to take these same bags and put them into regular plastic garbage bags. Most researchers attribute this to insanity. Researchers were also stunned to find that many Canadians will buy bigger plastic IKEA bags in order to store regular plastic bags in them. Once again, insanity is the only viable reason researchers could find why Canadians do that. Such reasoning also explains the average Canadians reluctance to purchase a made in Europe solution to waste and space. Until such time as a national bag registry is enforced with great rigor, global warming will threaten the people of yesteryear. But more studies are planned to determine the probability of success. GLOBAL warming will take a toll on children's health, according to a new report showing hospital admissions for fever soar as days get hotter. The new study found that temperature rises had a significant impact on the number of pre-schoolers presenting to emergency departments for fever and gastroenteritis. The two-year study at a major children's hospital showed that for every five-degree rise in temperature two more children under six years old were admitted with fever to that hospital. [..] Temperatures were the only negative risk factor, with findings linking heat to both fever and gastro disease but not to respiratory conditions. Surprisingly, rates of gastroenteritis were lower on days with a high UV factor probably, says Dr Lam, because the rays "sterilised" the ground, killing more germs and reducing risk. He said it was still unclear whether the heat directly triggered the illnesses or whether other heat-related problems, like pollution, were responsible. A longer-term study was needed add strength to the findings, Dr Lam said. A survey of 1,150 youngsters aged between seven and 11 found that one in four blamed politicians for the problems of climate change. Most of those polled understood the benefits of recycling, although one in 10 thought the issue was linked to riding a bike. The study marked Somerfield's drive to reduce the eight billion plastic bags wasted by UK households every year. No idiot or insane person shall enjoy the right of suffrage. However, idiots and insane persons shall hold elected office, in this and every other jurisdiction (see right). Jonathan Wilde observes in Catallarchy that the New Jersey State Senate wants voters to amend the language of the paragraph out of concern that it is "insensitive and discriminatory." Idiots and insane persons will no doubt be pleased, but the whole point of the provision in the first place, and rightly so, is to discriminate on the point of suffrage. Its only failure would at first appear to be that it does not clearly define idiocy or insanity, but this is really only a failure by the modern standard of sensitivity that declines to confront anything in, on or by such direct terms. Making a constitution more sensitive will hardly improve on this circumstance. Sensitivity is not the provenance nor purpose of a constitution — the effect of political rhetoric in the service of popular sentimentality will more likely be to ultimately desensitize citizens to political interpretations of their constitutions. Why not just ban power windows along with motorized vehicles? (CBC) The death of a Calgary toddler only underlines the need for car manufacturers to make power windows safer, says the founder of a U.S. advocacy group. "The car manufacturers know how dangerous these power windows can be and really haven't done their job in trying to make them safer for children," said Janette Fennell, the founder of Kansas-based Kids and Cars. Power windows, such as this one, should automatically reverse if something gets in the way, says Janette Fennell, the founder of Kansas-based Kids and Cars. The non-profit group has been fighting for years to make it mandatory for car manufacturers to offer power windows that automatically reverse if something gets in the way. [..] As part of its lobbying effort, Kids and Cars has a TV advertisement that shows a power window cutting right through vegetables. Unlike Fenris, Kids and Cars does not accept Canadian Tire money, but they do accept all major credit cards in return for public awareness propaganda. No matter how many regulations you pile onto the heap, children are going to have fatal accidents and people are going to die. While a parent might choose to purchase a vehicle with power window safety features, or no power windows at all, the surest way to prevent such deaths is to refrain from leaving your young children unattended in the car. I am not suggesting the mother should be charged, as she has already suffered the extreme penalty of losing her daughter, but I do note that public awareness campaigns and increased legislation are no substitutes for common sense. In a media release dated February 22, 2007, Ward Ten Councillor Paul Van Meerbergen has announced his intention to run for the federal Conservative nomination in London North Centre in anticipation of an upcoming election. Since his election to council in 2003, Van Meerbergen has been an absolutely consistent proponent of tax and spending reduction and private property rights on council, often standing alone in opposition to municipal waste, unnecessary capital projects, budget tax and spending increases, and needless bylaws that encroach on individual and property rights. Two years ago, Van Meerbergen authored a proposal to reduce municipal taxation by $1,000 per household. As the only voice on council that has fought to reduce the size and scope of local government, Van Meerbergen's unique contributions to municipal politics would be sorely missed in London, but his seeking of the nomination would also be a significant opportunity for Canadians as individuals and taxpayers to be allowed to advance their own interests. Today, City Councillor, Paul Van Meerbergen announced he is running for the Conservative nomination in the electoral district of London North Centre in anticipation of upcoming national elections. Van Meerbergen said: “I am happy to fight in the nation’s capital for lower taxes and a sound economy. I have worked for all Londoners on city council, whether on taxes, road improvements, or democratizing city hall, and I will work tirelessly for constituents in the London North Centre riding to represent their interests in Ottawa." Paul Van Meerbergen has been a resident of London for 20 years. He is married to Linda and they have four children. Van Meerbergen has been in charge of business development at Lamko Tool and Mold for 12 years. He has been active in the auto parts industry for several years, and is a former chairman of the London Chamber of Commerce Export Club. He has been active in community associations in London, including the United Way, The Heart and Stroke Foundation, Scouts Canada and has coached minor sports teams. Before working with Lamko, Mr. Van Meerbergen was the Ottawa parliamentary assistant to Conservative Member of Parliament, Terry Clifford, OC. 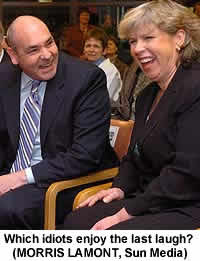 Prior to his Ottawa experience, Paul was Vice President of the Ontario Progressive Conservative Party for several years. The scheme set up under Division 9 of Part 1 of the IRPA suffers from two defects that are inconsistent with the Charter. 139 The first is that s. 78(g) allows for the use of evidence that is never disclosed to the named person without providing adequate measures to compensate for this non-disclosure and the constitutional problems it causes. It is clear from approaches adopted in other democracies, and in Canada itself in other security situations, that solutions can be devised that protect confidential security information and at the same time are less intrusive on the person’s rights. It follows that the IRPA’s procedure for the judicial confirmation of certificates and review of detention violates s. 7 of the Charter and has not been shown to be justified under s. 1 of the Charter. I would declare the procedure to be inconsistent with the Charter, and hence of no force or effect. 140 However, in order to give Parliament time to amend the law, I would suspend this declaration for one year from the date of this judgment. If the government chooses to go forward with the proceedings to have the reasonableness of Mr. Charkaoui’s certificate determined during the one-year suspension period, the existing process under the IRPA will apply. After one year, the certificates of Mr. Harkat and Mr. Almrei (and of any other individuals whose certificates have been deemed reasonable) will lose the “reasonable” status that has been conferred on them, and it will be open to them to apply to have the certificates quashed. If the government intends to employ a certificate after the one-year delay, it will need to seek a fresh determination of reasonableness under the new process devised by Parliament. Likewise, any detention review occurring after the delay will be subject to the new process. 141 The second defect is found in s. 84(2) of the IRPA, which denies a prompt hearing to foreign nationals by imposing a 120-day embargo, after confirmation of the certificate, on applications for release. Counsel for the ministers submitted in oral argument that if this Court were to find that s. 84(2) violates the Charter, the appropriate remedy would be to strike s. 84(2) and read foreign nationals into s. 83. This is a good first step, but it does not provide a complete solution, since s. 83 deals with detention review only until the certificate has been determined to be reasonable, whereas s. 84(2) deals with detention review after it has been determined to be reasonable. Striking s. 84(2) would therefore leave no provision for review of detention of foreign nationals once the certificate has been deemed reasonable. 142 Accordingly, I conclude that the appropriate remedy is to strike s. 84(2) as well as to read foreign nationals into s. 83 and to strike the words “until a determination is made under subsection 80(1)” from s. 83(2). "all the facts, all the time, all the...umm...something or other"
In a shocking move that has sent most of London into catatonic shock, City Council has announced a 6,000 percent increase in municipal taxes for 2007-2008. "Londoners have been telling us that they want a bold municipal government," said the mayor, sipping champagne after the announcement. "How's that for bold?" she asked. Then, after a moment's pause, added, "You motherfuckers." Read the rest here. Also worth checking out to get a flavour of living and newspaper reading in London: Family driven from home by Wortley Village feel good vigilantes and Son of famous dead guy visits London. A letter to the editor in today's Free Press neatly rebuts the pre-Galilean Stationary Earth claims of two Sisters of St. Joseph of London and its the Office for Systemic Justice in their Feb. 15 letter, Minimum-wage hike needn't hurt businesses. Contrary to the claims of the Office for Systemic Justice, the prevailing economic view that increases in minimum wage result in unemployment has not been discredited for being "based only on theoretical models of the labour market." It has not been discredited for the very reason that you can not discredit one of the basic economic laws, namely, the law of demand. Taking short-term statistics of isolated areas and ignoring the long-term consequences of price controls (wages) does not alter the fact that imposing minimum wages decreases the demand for low-skilled workers and reduces their ability to compete with others in the economic system, therefore forcing some into unemployment. The good Sisters of St. Joseph of London should consider that "justice" consists of equality of opportunity, not of outcome. Imposing minimum wages actually works against those who seek the opportunity to better themselves by working for wage rates that suit them. The Office for Systemic Justice is clearly a local relic of the formerly-rampant heterodox liberation theology that once propped up Marxist demagogues and regimes in the 70s and 80s in its quest to substitute scripture with subjective historical theological interpretations and politics. One of the sisters, Joan Atkinson, even once signed a petition of the Ontario Coalition Against Poverty — as brown-shirted a gang of thieves and robbers as can be found in the province. It is not given whether the author of the rebuttal letter, Glenn Howlett of Corunna, is the same former London general manager of community services who was driven from his job three years ago by stress, but it would not be surprising that a man of such concise and thorough sense as given above should suffer stress in extremis in the profoundly anti-rational corridors of city hall. by Premier Dalton McGuinty's estimate, replacing every old-fashioned bulb with an energy-efficient one would allow the province to shut down one coal-fired power plant. The simple and obvious fact is that both Mr. McGuinty and Mr. Tory are proponents of electricity rationing as a response to the power shortage caused by the Progressive Conservatives' de facto nationalization of the formerly privately-owned electricity system, and decades of price controls and subsidies for electricity. Having scared-off any interest in investment by the private sector, we're now facing years of electricity rationing. And, because the PCs, Liberals, and NDP are all as guilty as hell for the predicament we're now in, they're now resorting to trendy green lies about why they are imposing rationing measures. Banning the light bulb would have been proposed even if climate change palm-readings were not enjoying such good ticket sales. Here are some sobering facts. Banning 50 cent incandescent bulbs will relieve $4 fluorescent bulb manufacturers of price competition: the price of flourescent bulbs will most certainly be higher than they would have been but for the ban on incandescents. Banning incandescents will also relieve bulb manufacturers from competition on light quality: the currently harsh quality of the light provided by non-incandescent bulbs will not improve as quickly as it would have but for the ban on incandescents. This ban is a bad and harmful idea. We need more competition and private-sector involvement in power generation and delivery, not less competition and more government involvement in light-bulbs. We need more power, not more rationing. 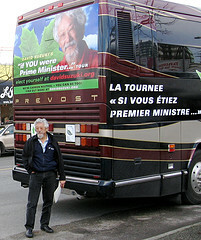 With all the alternative-energy modes of transportation out there, Suzuki and his entourage are crossing Canada in a sprawling, "rock-star-style" diesel-burning tour bus, emitting more greenhouse gases during his 30-day tour than many of us do in a year. That's right. Mr. Kyoto isn't so green after all. "It's diesel," Jason Curan, a media staff member on the Suzuki tour told Sun Media yesterday. "It's a tour bus -- kind of likeAC a rock-star tour bus." The kind that emits tons of greenhouse gases into the atmosphere and supposedly contributes to some future catastrophic climate event. [..] You want to know how many people are travelling with Mr. Kyoto in this oversized carbon burner? Seven. Sometimes eight -- including the bus driver. Eight people in a vehicle that could probably hold 30. 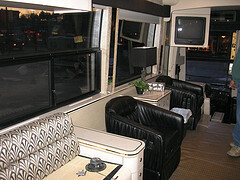 I guess that's what Curan meant when he said the bus was "kind of too fancy for our needs." [..] Here's the funny part: Suzuki says it's OK for his gang to burn diesel because the tour is "carbon neutral." That's right. They keep track of all the greenhouse gases they emit, put a dollar value on it and invest in a corresponding amount of "clean power" -- like windmills -- in developing countries. HT: Story and pictures via Free Dominion. And the former U.S. vice-president came bearing an inconvenient message for Canadian Prime Minister Stephen Harper and his rejection of the Kyoto accords. "Canada in the past has been known for its leadership, and I think now is a time when some people put a question mark after Canada on this," Gore said, after alighting from a limousine -- gas-operated, by the way -- for his sold-out speech to 1,500 at the University of Toronto's Convocation Hall. "I'm not a citizen of Canada but it's awful important for Canada to live up to its reputation," he said. "I love Toronto, I love Canada. Canada, I'm convinced, is going to come back on the right path." "New data shows a disturbing correlation between serious accidents and the ability of children to envision a world full of exciting possibility." The London Free Press reports that council last night approved a 2007 budget that raises residential property taxes by 2.51 per cent this year. After increases of 3.9, 5.9 and 6.6 per cent in the three preceding years, this year's hike may appear to be a relief — but such are the reduced expectations of Londoners. Property taxes get the big press, but Londoners will also be paying 5 and 11 per cent increases in sewer and water rates respectively. The average homeowner in London will still be on the hook for an additional $55 in property taxes and $48 in sewer and water charges. "We've seen taxes increase 31 per cent, not including this year, since 2000 and that outstrips any wage increases and the ability of hard-working homeowners to keep up," Van Meerbergen said. "We had a chance (to cut taxes), we had a choice and we didn't get the job done." London's politicians have long ago lost any pretense of control over the spending that has caused not only a 31 per cent increase in residential property taxes but also an almost 60 per cent increase in water and sewer charges over that same time, and a municipal debt that climbed to $371.1 million in 2006, the last year in which it was reported. The 2007 budget itself calls for $890 million in spending, which represents over $2500 per man, woman and child in London, or much more per actual taxpayer. The total tax bill for a home valued at $173,000 will rise to $3,335 this year, including charges, although taxes and fees paid by commercial properties will also be passed on to consumers. The city rationalizes its spending woes by saying that the city's "'basket of goods' is different from the 'basket' used in calculating the general inflation rate" — a pretext that can be used without any effort again and again because it is essentially meaningless. Unlike consumers, the city actually controls the prices of many of the goods in its "basket" but has shown little inclination to contain its price increases; city departments are not called on to justify their budgets but only the increases contained in generous targets that are themselves well above the rate of inflation, and this only in a desultory and relenting fashion by council. But the bigger problem is simply the city keeps putting more goods in its basket. Most of the $890 million is entirely discretionary spending by the city, and despite politician's protestations about downloaded costs to the contrary, the city actually does have express legislated control over most spending in the budgets of "regulated programs" — it chooses either not to exercise its control or to maintain its impotent pretences. In other cases, what the city presents as regulated obligations are strictly a fiction. We need to remind ourselves that we are in the business of providing "safe and affordable housing" as mandated by the Social Housing Reform Act. The return on investment is happier, healthier tenants and community… The real return on the investment would really be "PEACE OF MIND"
Deceit and fraudulent intent are apparently not the only goods that come from city hall. Such astonishing drivel and pandering preciousness barely belong in a Free Press editorial — they most emphatically do not belong anywhere in an administrative document that has otherwise serious ramifications to taxpayers. Some good news today for Status of Women workers who are soon to lose their jobs should they be employed at one of the 12 offices slated to close across the country. That $5 million is being redirected to increase fitness awareness: ParticipACTION is back! The federal government pledged $5 million over two years Monday to renew ParticipACTION, the federal fitness-awareness campaign. Starting in the early 1970s, the non-profit agency encouraged Canadians to get fit. The program included a series of television ads that encouraged people of all ages to "keep fit and have fun." The program ran for three decades, until its funding was cut in 2001. The federal government decided to renew ParticipACTION to help Canadians develop healthier lifestyles, said Secretary of State for Sport Helena Guergis. The focus is on kids 12 and younger, and groups at high risk, such as seniors, aboriginals and people with disabilities. Canadians frustrated with the crumbling health care monopoly are sure to welcome this redistribution of their money to fight obesity. Much like Status of Women Canada, the ParticipACTION agency will spend the money researching viable future research projects to promote fitness and well-being, meaning people will get paid to design fancy ads and lobby the government for more money and regulations though fat people and other "high risk" groups will continue to exist, just as they did during the three decades ParticipACTION existed. Organic and locally-grown food may be no better for the environment than conventional produce, according to a Government-funded report. For example, the report states that organically-grown tomatoes use 1.9 times more energy than regular tomatoes. Also, it points out that organic chickens require 25% more energy to rear and that organic cows use 80% more land to graze for milk and beef. Not only do organically-cultivated foods use more energy and land to grow, but emit more carbon dioxide than conventional farming. It estimates that organic milk emits 20% more CO2 than regular milk. This is due to the extra manure required to grow the feed for organic cows and poultry. What's more, intensely-fertilized land can lead to acidification of soil and the pollution of water tables. "Similarly there is little evidence that the consumption of locally sourced food products generally has a lower environmental impact than those from further afield." With all these depressing facts about organic farming, enviro-commies are further marginalized as hypocrites. They perpetually preach about climate change and the environmental damage caused by excessive CO2 emissions. That their own eating habits are to blame for more emissions being released is a hard genetically-modified pill for them to swallow. Environmentalism is the political albatross of the twenty-first century, having so well and truly wrung itself around the neck of decision-making that it is invoked in the most improbable of policies. In the hands of professional activists and politicians, the heavy-handed repetition of environmentalist rhetoric has long since transcended any conceit it may once have had as a form of consciousness, however hippie-rigged in the first place, into a fashionable prejudice… a prejudice that gives politicians a stump for populist posturing, and an expedient springboard for reflexive assent of even the most specious campaigns at all levels of authority, even down to the level of municipality. While debate at the earlier council committee level had focused on neighbourhood issues such as noise and traffic, Coun. David Winninger last night argued more is at stake— something of a global nature, the subject of the former U.S. vice-president's film, An Inconvenient Truth. If Canada is to reduce greenhouse gas emissions and meet the targets of the Kyoto treaty, Londoners could help by limiting the time drivers idle while waiting for a take-out coffee or a burger, Winninger said. "This is perhaps a luxury we can no longer afford … It's really a matter of a lifestyle choice. It's not a necessity," he said. "This kind of development is the antithesis of a creative city," Coun. Judy Bryant said. "I can walk from my house to five drive-throughs." This is supposed to representative of something, but for the life of me I can't imagine what except either that Judy Bryant lives at a major commercial intersection or that she can walk at least as far as anyone else. Good or bad for her, but for $29,000 a year we could at least be paying her for some sort of argument. A spectre is haunting the planet -- the spectre of climate change. 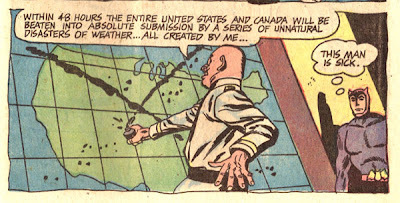 All the capitalist powers have entered into a holy alliance to exorcise this spectre: George Bush and Stephen Harper, Walmart and Ford, carnivores and Holocaust deniers. Where is the party in opposition that has not been decried as unrealistic by its opponents in power? Where is the opposition that has not hurled back the branding reproach of tyranny, against the more advanced opposition parties, as well as against its reactionary adversaries? I. Climate change is already acknowledge by the UN to be itself a reality. II. It is high time that global warming activists should openly, in the face of the whole world, publish their views, their aims, their tendencies, and meet this nursery tale of the spectre of global warming with a manifesto of the party activists. To this end, the International Panel on Climate Change have assembled in France to deliver their manifesto. Our epoch, the epoch of SUV drivers, possesses, however, this distinct feature: it has simplified class antagonisms. Society as a whole is increasing measured by their ecological footprint. Stay tuned for the next installment: "To produce is to destroy." I'm not getting any money from my foundation. I'm getting my money, the foundation gets its money, from ordinary people. We don't take government money, corporations have not been interested in funding us. We get it from ordinary Canadians across the country. 40,000 thousand of them and we get some foundations in both Canada and the United States. So that's my agenda. We speak on behalf of the people that fund us. After Suzuki insinuates that scientists who disagree with him are "shilling" for big corporations, Oakley asks him where he gets his funding. Suzuki replies that his foundation takes no money from governments and complains that “corporations have not been interested in funding us." Corporations uninterested? 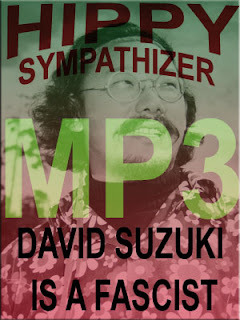 Is it possible that the Great Suzuki has failed to attract a single corporate donation to his feel-good campaign to save the earth? Not one? Actually, the David Suzuki Foundation’s annual report for 2005/2006 lists at least 52 corporate donors including: Bell Canada, Toyota, IBM, McGraw-Hill Ryerson, Microsoft, Scotia Capital, Warner Brothers, RBC, Canon and Bank of Montreal. The David Suzuki Foundation also received donations from EnCana Corporation, a world leader in natural gas production and oil sands development, ATCO Gas, Alberta’s principle distributor of natural gas, and a number of pension funds including the OPG (Ontario Power Generation) Employees’ and Pensioners’ Charity Trust. OPG is one of the largest suppliers of electricity in the world operating 5 fossil fuel-burning generation plants and 3 nuclear plants... which begs the question – is Suzuki now pro-nuclear power? They continue to believe this trash because they are a cult. Liberal Senator Colin Kenny takes home the "Best Comedic Performance by an Unelected Official" award for his lavish $138,000 overseas trip to Dubai where no work was performed. Also, Kenny lobbied for an increase in senator office budgets from $135,000 to $200,000 "to move up to match the House of Commons." Liberal MP Jim Karygiannis wins the "Best Disappearing Act" for missing every one of the 32 House of Commons votes in the 39th Parliament. Ontario Liberal Premier Dalton McGuinty takes home the "Lifetime Achievement Award" for his stunning reversal on taxes with his "I won't raise you taxes, but I won't cut them either" tag line. However, for the "Municipal" category, London was unfortunately overlooked for this award. Instead, it went to Edmonton for spending $30,000 on a yo-yo campaign. Another notable mention goes to Montreal for paying their road maintenance crews $22 an hour over a 90 hour period to fill just nine potholes. Don't feel down London city council, you'll be getting your 15 minutes of shame with a Teddy award sooner or later. Your pork-barreling and mismanagement is bound to be spotted by the CTF and brought to light. 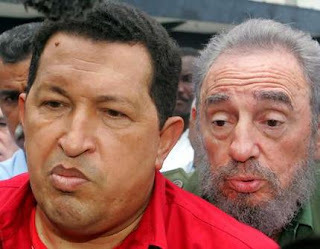 Hugo Chávez tears a page from Robert Mugabe’s daybook. [..] Public spending grew last year by more than 50 percent and has more than doubled since the start of 2004, as Mr. Chávez has channeled oil revenues into social programs and projects like bridges, highways, trains, subways, museums and, in a departure for a country where baseball reigns supreme, soccer stadiums. [..] Shortages of basic foods have been sporadic since the government strengthened price controls in 2003 after a debilitating strike by oil workers. But in recent weeks, the scarcity of items like meat and chicken has led to a panicked reaction by federal authorities as they try to understand how such shortages could develop in a seemingly flourishing economy. According to the London Free Press, city staff are lobbying council to shift the costs of road and sewer projects for new developments from taxpayers to developers, prompting a return volley of lobbying from developers to maintain the status quo. Currently taxpayers directly pay 54 per cent of road construction and 10 per cent of sewer costs. Municipal revenues, however, also profit from the expansion in the assessment base that new developments bring in, so the net cost or benefit to taxpayers themselves is impossible to quantify — although it should be supposed that, with council's appetite for gobbling up revenues for pet projects that create future tax obligations and benefit only a handful of Londoners, the net effect to taxpayers is probably a cost. Resolution of the issue is complicated, as always, by public ownership of assets. Public ownership and control of roads and sewers implies, of course, that its benefits accrue to the municipality and that it should at the same time be liable for all its costs. If the city cannot afford to continue the same cost-sharing arrangement with developers — a difficult proposition since it can apparently afford all sorts of other frivolities — a reasonable and equitable compromise would be that it release its zoning and approval claims of control over development in return for ceding its costs to developers. Maintaining control over development without assuming its costs is only a method for sustaining political environmental agendas, an all-too-common trick of modern administrations to pass of the costs of social and environmental engineering projects onto private businesses. The hedging of political bets over the proposed retail development at Fanshawe Park Road and Highbury Avenue owes as much to the debate over costs as of the desired social and environmental engineered effects of some politicians. The argument has the potential to pit development's biggest supporters on council against those more concerned about traffic congestion and pollution. … The environment is definitely a concern when drive-throughs are debated, [Coun. Joni] Baechler confirmed. 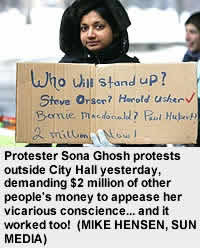 That'll be alright for her to say when the rest of us can get our double-double at city hall's subsidized cafeteria. One of the more unfortunate parts of the political liturgy of the 1960s, the silly and shiftless reproach to "listen to the younger generation," is being tossed around a lot again these days, particularly in connection with environmentalist politics. This time around, however, a guileless and unwashed youth is not so much trying to call attention to itself as it is brought to you by their political elders as a modern marketing device, of which two baleful examples are found here and here. This cynical appropriation of youth not only imbues political environmentalist agendas with a faux-sentimental veneer, it also harps at adults to accede to policies they would not otherwise agree to for themselves because children are supposed to have "learned things" in their education that they did not… which is true enough, especially if the children received a public education; they certainly have learned "things" if not much else. The chain of accountability from parents to the education their children receive in a centralized, universal and public system is attenuated by so many teachers' unions, ministry bureaucrats and politicians that parents can bring little of their children's time in school to actual account. Having effectively nothing at all to do with the preferences of parents, the "things" of education — ie., what do we do with these little buggers for thirteen years? — becomes subject instead to a kind of political triage where practises, the curricula, are decided by the political advertising requirements of its practitioners. Schools become message campaign centres for politically fashionable crusades and "appropriate behaviour" according to elitist prejudices: revisionist culturalism, anti-bullying, public health, environmentalism, and so on. But it is a trial of sanctimony, platitudes and prejudices that ultimately deadens enquiry and occupies so much time that students graduate either utterly disinterested in their education or able only to parrot the preconceived messages without the literacy to defend or to expound on them. Like anything else, the results of a system decided by the competency of unions, bureaucrats and politicians should come as no surprise to anyone. What is suprising is that we should be expected to listen to their products. Can I have the extra large state intervention to go? The value of a growing element of suburban life -- the drive-through -- has come under question at city hall. The answers could affect where you get your morning coffee or how noisy your street gets. Council will consider tonight a planning committee recommendation that city staff develop a comprehensive policy on drive-throughs. The premise behind regulating the drive-thru industry is disguised in the name of preventing "noise" and "car congestion". However, its real purpose is to dictate where legitimate private businesses can locate. As well, it's a form of nanny-state social engineering by telling consumers how to live their daily lives. City Hall's lust for more control over free enterprise is becoming paramount while the choice of the individual is taking the back burner. This non-issue serves as nothing more than a distraction from the real issues facing council, such as the recent special-interest group spending that has deprived ratepayers of tax relief. So far "we are flying by the seat of our pants" on drive-throughs, planning committee chairperson Joni Baechler said yesterday. "We have no stand-alone policies relative to drive-throughs. We don't have any policy that says, 'Put them there.' "
Now here is an interesting fact about councilor Joni Baechler. She is considered to be a so-called environmentalist on council yet the reality is she is a hypocrite at best. In fact, she lives in a suburban, car-friendly neighbourhood in her North London ward. Basically, she is nothing more than a "soccer mom tree hugger" or a "pseudo-environmentalist"--a person who labels them self as an environmental champion, when in fact, they are really the exact opposite of what they attempt to be portrayed. If the latest grand redistribution scheme is carried out by the thugs controlling the public purse in Britain, it will soon be "more profitable" to live in the slums, and likely inevitable, unless you are a member of the governing elite. The tax on "nice neighbourhoods" is being planned as part of the council tax revaluation, with proposals expected within weeks. Secret manuals by the Valuation Office Agency, an arm of HM Revenue and Customs, used in the controversial 2005 council tax revaluation in Wales, reveal that many homes near shops and public transport, with pleasant views and in quiet locations were penalised, with higher council tax bills. There are now plans for the same system to be rolled out across England. [..] The plan follows revelations in this newspaper that people who live in areas with good schools, clean streets and low crime rates face big increases in their council tax bills. Home owners and tenants will be charged hundreds, and possibly thousands, of pounds extra if they live in a locality deemed by ministers and officials to be more desirable than others. The rises could be as great as four times, sending some bills from £1,000 to £4,000. For the first time, data provided by the national census, school exam results and crime statistics will be fed into the calculations. Householder income, cohabitation and, in what many MPs will regard as a highly contentious move, ethnicity will be taken into account. The information being used by the Government distinguishes between "farming communities", for example, and "multi-ethnic, crowded flats". HT to Darcey of Dust my Broom for the story. Though David Suzuki continues to travel across the country with his entourage, the rest of us have no right to privileged modes of conveyance such as SUVs and cars because "growth" is bad. Take the bus, or ruin the planet was the message delivered to members of the Travel Media Association of Canada in London Ontario on Saturday, the hometown of his spawning. (Lfpress) Humans are committing suicide by destroying the planet, environmental crusader David Suzuki said yesterday in London, calling for immediate action on climate change. "This idea that we've got to have steady growth forever is suicidal," he said. "All of this talk about growth and 'we've got to have more' is just saying we've got to hurry up what is a suicidal course." [..] Suzuki said he's shocked some people, after asthma attacks on smog days, are brought to hospital emergency rooms in SUVs. "It would never occur to them that by the act of buying and driving a car, they're part of the creation of the problem they're dealing with," he said. Continued increases in the standard of living result in longer life expectancy rates, leading to over-population and carbon poisoning. Next time you or one of your loved ones needs to go to the hospital, remember the polar bears and take the bus instead of the car.